The Lancers Quadrille is perhaps the most graceful and animated of any. Within the last few years it has become a great favorite in fashionable circles, probably owing to its revival at the state balls of Her Majesty. It admits of much skill and elegance in executing its quick and varied figures, a correct acquaintance with which is absolutely requisite to all who take part in it. 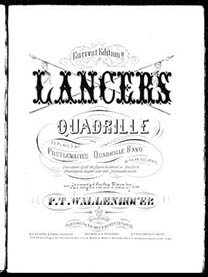 Unlike the common quadrille, the Lancers must be danced by four couples only in each set; though of course there can be many sets dancing at the same time. The number being so limited, one awkward or ignorant person confuses the whole set; therefore, it is indispensable that every one who dances in this quadrille should have a thorough mastery of its graceful intricacies. We have observed that of late it has become the fashion to substitute new tunes for the old well-known music of the Lancers Quadrille. We cannot consider this an improvement. The old simple melodies are peculiarly fitted to the sprightly, joyous character of the dance; which is more than can be said for any of the modern substitutes. When these are used, the Lancers, in our opinion, loses its individuality and spirit, becoming almost like a common quadrille. We should be heartily glad to see the old tunes restored once for all to their rightful supremacy. The sets of four couples, top, opposite and sides, having been arranged, the dance begins as follows:--_1st Figure_.—First lady and opposite gentleman advance and retreat; advance again, joining their hands; pass round each other and back to places. (1st eight bars.) Top couple join hands, and cross, opposite couple crossing at the same time, separately, outside them; the same reversed, back to places. (2nd eight bars.) All the couples balancez to corners; each gentleman turns his neighbor's partner back to places. (3rd eight bars.) Second couple repeat figure from beginning; after them side couples, those who stand to the right of top couple having always the priority, as in the common quadrille. 2nd Figure.—First couple advance and retreat, gentleman holding lady’s left hand; advance again; gentleman leaves his partner in the centre of the quadrille, and retires to place. (1st eight bars.) Balancez to each other and turn to places. (2nd eight bars.) Side couples join first and second couples, forming a line of four on either side. Each line advances four steps, retreats ditto; then advances again, each gentleman reclaiming his partner, and all turn to places. Second and side couples repeat figure in succession. 3rd Figure.—First lady advances four steps alone, and stops; vis-à-vis gentleman does the same; first lady retires, facing gentleman, to whom she makes a slow profound courtesy. (The courtesy must occupy a bar or two of the music; and as, if made with grace and dignity, it is most effective, we would recommend ladies to practice it carefully beforehand.) The gentleman at the same time bows and retires. (1st eight bars.) All four ladies advance to centre, give right hands across to each other (which is called the double chain), and left hand to vis-à-vis gentleman; then back again, left hands across in the middle, and right hands to partners, back to places. (2nd eight bars.) Second and side couples repeat figure from commencement. A more recent fashion for dancing this figure is as follows:--Instead of one lady advancing at first, all four advance, and courtesy to each other; then turn and courtesy to their partners. Ladies do the moulinet in the centre; that is, give right hands across to each other, and half round; left hands back again, and return to places. Gentlemen meantime all move round outside the ladies, till each has regained his place. Figure, as usual, repeated four times; but the second and fourth time the gentlemen advance instead of the ladies, and bow, first to each other, then to their partners; continuing as before through the rest of the figure. 4th Figure.—Top gentleman, taking partner’s left hand, leads her to the couple on their right, to whom they bow and courtesy (which civility must be met with the like acknowledgment), then cross quickly to fourth couple, and do the same, (1st eight bars.) All four couples chassez croisez right and left (gentleman invariably passing behind his partner) then turn hands (tour des mains) back to places. (2nd eight bars.) First and opposite couples right and left across and back again to places. (3rd eight bars.) Second and sides repeat as usual. 5th Figure.—This figure commences with the music. Each couple should stand ready, the gentleman facing his partner, his right hand holding hers. If every one does not start directly the music begins, and does not observe strict time throughout, this somewhat intricate figure becomes hopelessly embarrassed; but, when well danced, it is the prettiest of the set. It commences with the grande chaine all round; each gentleman giving his right hand to his partner at starting, his left to the next lady, then his right again, and so all round, till all have returned to their places. (This occupies sixteen bars of the music.) First couple promenade inside figure, returning to places with their backs turned to opposite couple. The side couple on their right falls in immediately behind them; the fourth couple follows, the second couple remaining in their places. A double line is thus formed—ladies on one side and gentlemen on the other. (3rd eight bars.) All chassez croisez, ladies left, gentlemen right, behind partners. First lady leads off, turning sharply round to the right; first gentleman does the same to the left, meeting at the bottom of the quadrille, and promenade back to places. All the ladies follow first lady; all the gentlemen follow first gentleman; and as each meets his partner at the bottom of the figure, they touch hands, then fall back in two lines—ladies on one side, gentlemen on the other—facing each other. (4th eight bars.) Four ladies join hands, advance and retreat; four gentlemen ditto at the same time; then each turns his partner to places. (5th eight bars.) Grande chaine again. Second and side couples repeat the whole figure in succession, each couple taking its turn to lead off, as the first had done. Grande chaine between each figure and in conclusion.